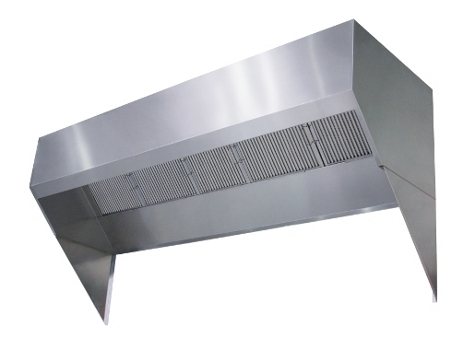 T-BD-2 Series hood application: Low proximity, low CFM requirements. This Type I Hood is designed for all types of cooking equipment with surface temperatures ranging from 450°F to 600°F. Optional front plenum provides make-up air. Product requires minimal kitchen space. ETL Listed for use over 450°F and 600°F cooking surface temperatures. ETL Listed to Canadian safety standards, ETL Sanitation Listed and built in accordance with NFPA 96. Separate flue gas chamber not required. Sturdy stainless steel construction with double wall, insulated front panel on 30" wide and larger models. Unique front design prohibits condensation and directs grease laden vapors toward the exhaust filter bank. Stainless steel is finished on both interior and exterior sides of the front to enhance aesthetics. All hoods come standard with aluminum baffle filters. Captrate Combo©, Captrate Solo©, high efficiency stainless steel baffle, and stainless steel baffle filters are optional. High velocity cartridge filters are available on the CBD series. Factory pre-wired lighting to illuminate cooking surface. Not included on 24 or 26 inch widths. Space saving, compact design uses limited kitchen space (24" minimum width). Optional UL Listed light and fan control switches pre-wired and flush mounted through built-in electrical chaseway on 30" and wider models. Built in rear air space to meet NFPA 96 clearance requirements against limited combustible wall with optional insulation for combustible wall. Fire suppression and Self Cleaning water wash options available for all sizes. Double-wall, insulated front increases rigidity and reduces condensation. 30 inch width and larger. Fitted with 16" high, UL Classified, aluminum baffle filters, removable for cleaning. Optional Captrate Combo©, Captrate Solo©, high efficiency stainless steel baffle, stainless steel baffle, and high velocity cartridge filters are available. Grease trough drains into removable 1/2 pint grease cup. Fitted with UL Listed, pre-wired, incandescent light fixtures and tempered glass globes to hold up to a standard 100 watt bulb. Not included on 24 or 26 inch widths. A built-in wiring chase provided for optimal positioning of electrical controls and outlets on front face of hood without penetrating capture area or requiring sleeve on 30 wider and larger models. Built in air space to meet NFPA 96 clearance requirements against limited combustible wall with optional insulation for combustible wall. Model T-BD-2 is ETL Listed for 450°F and 600°F cooking surfaces (File 102900319PRT-001 without exhaust damper), ETL Sanitation Listed and built in accordance with NFPA Standard 96. UTILITY CABINET: ETL Listed for integral top mount on the ThermoTek Systems ventilation hood...fabricated of same material as hood...the cabinet can house factory pre-piped UL Listed fire suppression system* and ETL Listed, pre-wired electrical controls...pre-wire package* contains light switches, lighted fan control switches and internal factory wiring and components (starters, relays, etc.) to reduce field wiring requirements. ETL tests confirm temperatures do not exceed 120°F inside the cabinet during fire condition. (120°F is the maximum allowed storage temperature for the UL Listed fire suppression system and the ETL Listed Industrial control panel. REMOVABLE ETL LISTED HIGH-VELOCITY CARTRIDGE FILTER: Constructed of stainless steel...uses centrifugal force to remove grease and other particulates...National Institute of Standards and Technology methodology used by an independent agency to evaluate performance...tests indicated 95 percent extraction efficiency. HEATED MAKE-UP AIR: ETL Listed direct fired gas heated make-up air unit manufactured by ThermoTek...ETL Listed for natural gas and propane...design integrates the blower and burner into a single package...heavy duty, weather resistant, galvanized steel construction...units available in Roof Top Package or as a stand alone heated make-up air module...several models available to meet almost any performance rating specification. ThermoTek sells this hood as a stand-alone appliance to be integrated into a kitchen ventilation application. ThermoTek also provides this hood as part of a FULLY INTEGRATED PACKAGE designed by ThermoTek and pre-engineered for OPTIMUM PERFORMANCE. The package consists of the hood, an integral ETL Listed utility cabinet, factory pre-wired ETL Listed electrical controls, and a factory pre-piped UL Listed fire suppression system. Other options include a ETL Listed exhaust damper, a ETL Listed exhaust fan, a ETL Listed non-tempered make-up air fan, and/or a ETL Listed direct-fired heated make-up air unit. Fire suppression systems include final hookup and inspection. The T-BD-2 Model has been certified by ITS. This certification mark indicates that the product has been tested to and has met the minimum requirements of a widely recognized (consensus) U.S. and Canadian products safety standard, that the manufacturing site has been audited, and that the applicant has agreed to a program of periodic factory follow-up inspections to verify continued performance. Models T-BD-2 are ETL Listed under file number 102900319PRT-001 and complies with UL710, ULC710 and ULC-S646 Standards.